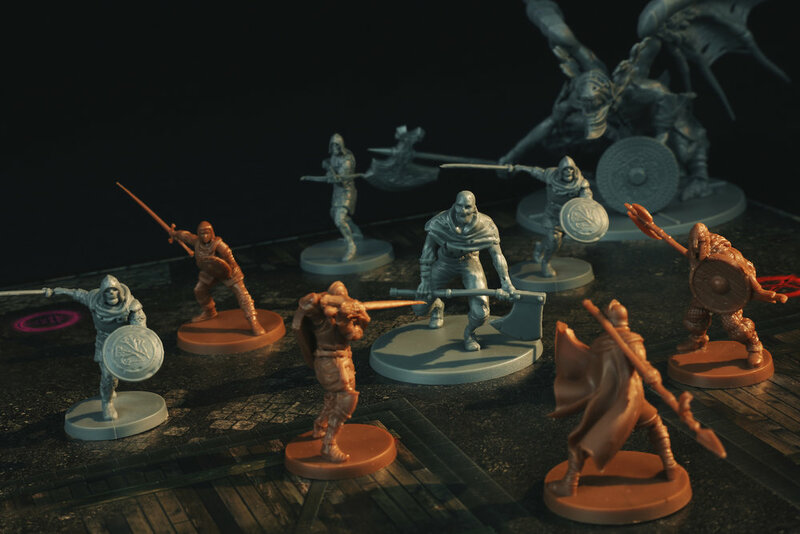 Dark Souls™: The Board Game is a cooperative dungeon crawl for 1-4 players. To win the game, you and your friends must work together to learn how to defeat the Hollow Soldiers & Silver Knights before finally overcoming the monstrous bosses. You will learn their specific attack patterns and weaknesses, but beware, when a single player dies…the entire party must respawn at the nearest bonfire. Use your resources sparingly, learn quickly, and prepare to die. You and up to three friends will take control of four iconic classes from Dark Souls™; the Knight, Assassin, Herald, or Warrior. Each with their own unique in-game abilities and varying stats you’ll need to work together to fight your way past Hollow Solider, Silver Knights and the dreaded Sentinels to reclaim your Humanity. A fearsome array of enemies stand before you, each with their own unique attack pattern that you must out manoeuvre lest you return to the Bonfire. There are hundreds of weapons and armour sets to collect as you progress through the game. Upon reaching the fog gate you will have to decide if you are ready to fight these truly terrifying, huge, foes. Their attack patterns change every time you fight them, and midway during the fight they will heat up and reshuffle their attacks. Before the game begins you will choose a Mini Boss; a Gargoyle, a Titanite Demon, a Boreal Outrider Knight, or a Winged Knight. Then once you have bested that obstacle you must choose a Main Boss! Will you pick the Dancer of the Boreal Valley, or the fearsome duo of Ornstein & Smough? The Gaping Dragon Expansion adds new encounter cards which provide larger battles than ever before in Dark Souls™: The Board Game. The tremendous scale of these encounters creates a whole new level of peril to you and your party.